Hello again! Ok so as promised, I have another post for you today. It's another recipe post because although I have had no time to take pictures of my incredibly fab outfits (not really, but a girl can dream), I have been cooking up a storm! The Hubs and I made a recent, spur-of-the-moment splurge on a fancy new kitchen appliance to help guide us on our healthy eating journey. 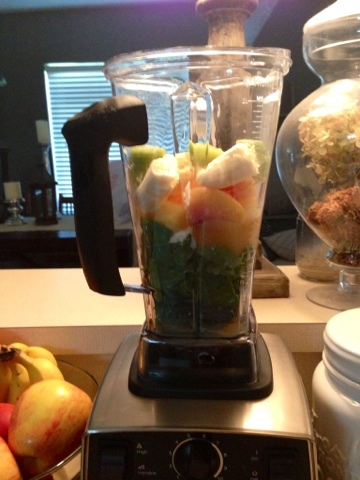 It's called a Vitamix, and we are OBSESSED! I know it's expensive and I know I sound like a lame company representative right now, but it really is so much more then just a blender. I mean I am willing to go pretty far out there and call it a "miracle worker" because it made the Hubs not only eat kale...but like it too! I know I know, you must think I'm fibbing, but it's the truth and I'm willing to share the secret. For a week now we have been drinking fruit and veggie smoothies for breakfasts and snacks and it has changed our life for the better. 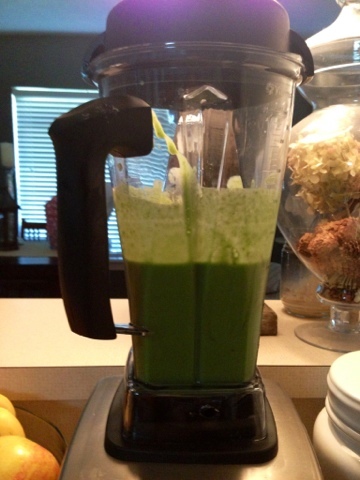 The best part is that the Vitamix blends it all so fine that you would never even know the veggies are in there, except they leave almost every smoothie a pretty bright green. We have tried many different fruit combos, but today I will share with you my Hubbie's favorite. Enjoy!!! Place all the ingredients into your blender. Blend thoroughly and add more almond milk if needed for a creamy texture. Enjoy!